Bill Stumpf perhaps is known as the designer of the Aeron chair for Herman Miller. 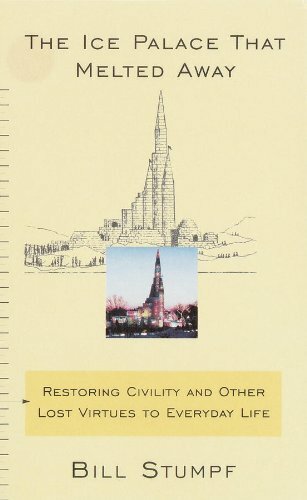 In this book he addresses the decline of civility in the States and propose ways to restore them. The book is subtitled "restoring civility and other lost virtues to everyday life". The book is structured into three sections with short chapters explaining his concepts and thinking. In the first chapter, Stumpf redesign the trusty 747 as an example. Our technology allows us to sanitized natural experiences. Air conditioning. Heating. Flying through the air in a metal box with enough fuse to cause a major explosion. We are safe when flying. But there is the emotion and enjoyment of flying? He reminds us that we should reunite the (positive) emotion with the experience. Bring back the pleasure of flying. Interesting enough, he proposed giving the passenger more feedback by showing flight plans and outside views on the video monitors. Most new 747 does this now. He also propose bigger windows and seating that give better views. Star gazing. Boeing's new 7E7 has some of these ideas implemented, including much larger and taller windows. Perhaps their designers read this book. In this chapter Stumpf reminds us that we should not completely isolate the dirty part of living. Cocooning in the suburbs. Hiding the inner working of society, factories, manufacturing plants. Ignorance is bad. We should be able to see and tour these necessary part of living. This chapter is confusing to me. Stumpf's writing is reasonable simple in most cases but in some chapters he seems to be combining a few too many thoughts. The main theme I found in this chapter is the importance of small graces. He used the lowly brown paper shopping bag with handles as an example. Compare to the alternative of the plastic shopping bag. The brown bag, especially after adding the handles, is a wonder in design that enrich our lives. It is strong. Easy to carry. Hide the content. It will stand up when place down on the counter so content won't spill out. It is reusable. Stumpf equates Grace with Civility, which I agree completely. Technological progress is good, but there is no reason to throw out the old completely. Good design should combine the old with the new. Retain the civil spirit with new technological sophistication. Stumpf compares the London cab (taxi). It is comfortable and roomy. Passenger sit facing each other so that one can have a conversation. Big doors make entrance and exit easy. It has character. It brings pleasure to the ride. If NYC ever were to redesign their taxi, Stumpf sketched out a new design that marry the civility of the London Cab with the new transportation technology. This is the chapter that gave the book its name. It describes the 1992 St. Paul Winter Carnival. The city commissioned a grand ice palace design and built by volunteers. At the end the ice palace melted away of course. But the people senses that they are a part of something bigger -- a community of civilized human beings. This chapter is about the importance of play. Rationality sometimes removes play from work. Play is important. Work for the love of it is important. Stumpf talks about making things that last. We are increasing obsessed with the next new thing, chasing fads, upgrades. Making things last is not only environmentally sound, but it let us focus on living instead of just consuming. While I agree with point most of the time, when it comes to computers, do we have a choice but to upgrade every or every other year? This is another chapter that I find confusing. I think it is a criticism of our mass media. The new connected global village bring us too close to everything. Sometimes one can see more clearly by seeing from a distance. We need to improve the quality, not the quantity of the media. Stumpf remind us of Carl Jung's notion of progress: Only through the pursuit of wisdom and understanding, and not merely the betterment of conditions, can we arrive at a civilized view of life. This ends the first section of the book, talking about things of civility. Stumpf uses the Harlem Prep Street Academy as an example (he helped design the school in the 60's) to show that art and design contributes to the quality of life. He laments the lack of focus in art and design in America. There are few public museum dedicated to design. We equate design with high end products only. Instead, one should try to surround oneself with art and good design. The important of beauty. Stumpf moves on to the discussion of public civility. Using a new defunct public health service, the Red Door in Minnesota as an example, he noted that compassion is a source for public civility. Personal Anonymity for clients to the health clinic is an act of public civility. Using the lack of public bathroom as an example, Stumpf lightlights the fact that in the States we do not offer the public simple support for a basic human need. He said in Switzerland, the dogs have better toilet accommodations than humans in Houston. Highway rest area without toilets is another example. We have advance technology for bathrooms -- the height adjustable toilet for the disable or elderly, Japanese bidet-toilet combination that provide a paperless and odorless hygiene system exists. We need public civility. Another chapter on public civility, and the importance of small gestures. European often have free public access to clean fresh drinking water in public places. These few chapters seems to deal with the importance of community. The Lake Harriet district has a creed. It calls for each individual to take responsibility of living there, to build and maintain a civilized communities. (Minnesota nice is real). "The Beer and Bacon Sandwiches at 5:30am" chapter highlight the need for urban food markets. The "Staying Put" chapter talks about the importance of home, building roots, and hence communities. The "Min og Bo" chapter describes simple a head stone and a well design church cemetery in Copenhagen. The fact that design can help preserve civilization -- there can be civility in death. These end the section on places of civility. The discussion is certainly shorter, most of them reflect on the need of community and public civility. This chapter is the beginning of the last section of the book. These chapters talk about paths of civility. In this chapter Stumpf recalls his experience in a London pub. The English pub has an etiquette that when a customer leaves his seat, it is assume that he will be back and his seat is saved, unless the customer explicitly say that he is leaving. The kindness of strangers is the path of civility. The kindness of strangers helps maintain people's self esteem. This is another confusing chapter. I think it addresses the need for awareness of public safety and community awareness. The path of walking to school is a metaphor. Stumpf references two different characters in this chapter. D.J. is D.J. DePree, one of the founder of Herman Miller. Dursu is a fictional character in a Kurosawa film, Dursu Usala. DePress apparently have a habit of cleaning up any restroom after he used them. Dursu cleans up campsite as he travels. Both characters leave things better than they found them. This is about care-taking. One should care about, and take care of not only things that one own, but things that one share. That is another path to civility. Stumpf using a police station in Europe as an example, to ponder about whether it is better to not isolate and hide the bad from the good. This echoes his earlier chapter on hiding the dirty part of living, the factories and the manufacturing plants. Is it possible to make jail and police station a part of the community. Public civility by meditate the extremes without destroying the extremes. Stumpf points out that retirement is not the end of living. It is possible to plan and to grow old gracefully. Retirement is an artificial marker in the path of living. The last chapter of the book takes up the redesign of the Red telephone booth in Britain as an example. We should not throw out the past because it is obsolete. He propose to retain the past grace and civil spirit when building the new for the present. This is similar to the discussion of London taxi cabs in the early chapter. The path of civility is time again? I find this chapter ends the book rather abruptly. So what is Civility and how do we restore it? Stumpf gave the reader many examples of what is civil and what destroys it. Grace is often mentioned. When one searches for comfort, one is really searching for civility. He uses Willian Gass's definition of comfort, which is "a lack of awareness". If you are wearing a good pair of running shoes, you will not feel the shoes. It becomes part of the background. Civility is comfort, hidden goodness, social lubricant, personal worth, helping others, play -- civility is the joy we take in our human achievements and the compassion we show towards our all-too-human faults. Civility can be extended by technology and can be obliterated by it. Civility is toleration, understanding. It is the integration of differences, not the heightening of them. Civility can be found anywhere -- in the great faux city of Las Vegas and the backwaters of the Midwest.